Mobility analytics company StreetLight Data Inc. has launched another transportation market innovation with the release of its new Annual Average Daily Traffic (AADT) metrics that are now available on-demand through the company’s InSight big data management platform. Annual traffic counts available on-demand for any roadway in the USA are considered a ‘holy grail’ by transportation planners and engineers. Historically they have had to task staff or consultants with manually counting, installing equipment or modeling traffic, which is neither feasible nor accurate enough for understanding road congestion at scale. Now available for any road in the USA, whether large or small, and for both rural and urban areas, the company’s 2017 AADT counts outperform industry-standard accuracy targets, as published recently in StreetLight’s 2017 AADT Methodology and Validation white paper. Data from more than 2,400 permanent count stations across the country were used to train and validate the big data algorithms behind 2017 AADT. With new federal requirements put in place by the ‘Moving Ahead for Progress in the 21st Century Act’ (MAP-21), local and state government agencies must increase reporting of performance metrics for planning and funding allocation. This, in turn, has increased the need for quick, easy, dynamic and cost-effective AADT measurements. 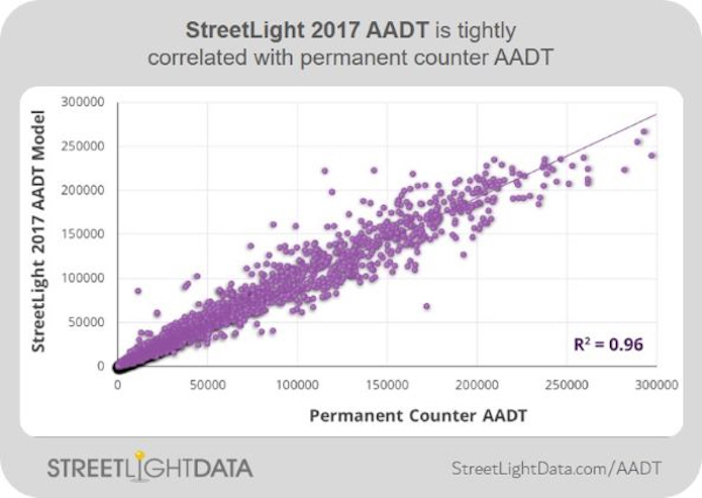 The diversity and accuracy of data feeding StreetLight’s AADT algorithms are a key competitive advantage. They include 365 days of data from more than 65 million smartphones, connected cars and trucks, as well as census data, road network information and other sources. The company says its data resources are larger and more spatially accurate than cellular data used by its competitors. The new AADT metrics are now available on-demand through the company’s InSight system, which the world’s first Software as a Service (SaaS) platform for mobility. InSight applies proprietary machine learning algorithms to more than four trillion mobile location datapoints, measuring diverse travel patterns, and making them available to agencies for identifying sources of congestion, optimizing new infrastructure, or planning for autonomous vehicles and smart cities. “We measure and analyze the movements of millions of vehicles across four million miles of US roadway, collecting and processing 365 days of traffic data,” explained Laura Schewel, CEO and co-founder of StreetLight Data. Stephen S Yoon, senior regional planner at the Southern California Association of Governments (SCAG), the USA’s largest metropolitan planning organization (MPO), noted, “For most roadways, we collect AADT using temporary traffic count sensors that operate for two to seven days with limited information.